Being an NPC Global customer means you’re in good hands. Our team of experienced sales account management professionals constantly monitor and direct your customer experience from day one. It all starts by learning your business, timeframe's, buying habits and product cost requirements and responding with smart packaging recommendations, alternatives and service options. This is an ongoing process which ensures your spending on packaging is extremely efficient while always keeping an eye on taking advantage of future improvements and cost-savings initiatives. We stress the need for on-time delivery and providing logistical options for next day delivery across the Continental US. 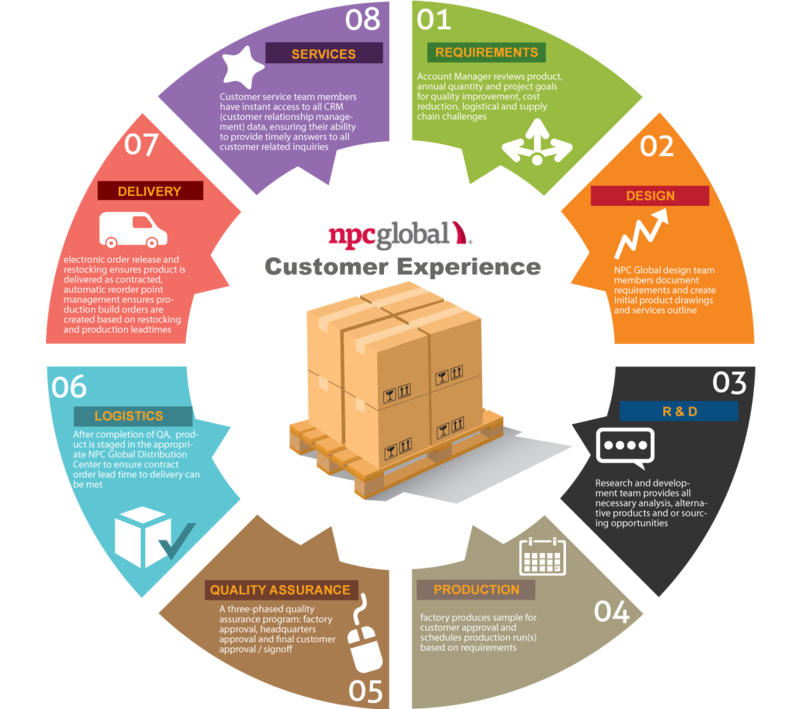 Our state-of-the-art Customer Relation Software enables our NPC Global departments to know our customer's personal preferences for delivery days, times and needs regarding delivery scheduling, pallet sizing as well as convenient times for meetings and phone calls. Our ever expanding service options grow with your business requirements. NPC Global’s inventory release programs can enable you to purchase in bulk for savings and cut floor space by storing your supplies in our distribution centers and providing instant product release shipping for which our customers are invoiced only when ordered. Utilize our e-Business solution for placing orders and essential electronic updates via industry standard EDI. We also have programs for automatic time release of our customers most widely used supplies as well as automatic inventory replenishment and inventory trend analysis to ensure zero supply outages across all your locations. Professional and courteous customer support is our mission and our pleasure.